Above : The Beavers set up their base camp in the wet weather hall, where they would rest overnight before starting their expedition to the site tuckshop the following morning. 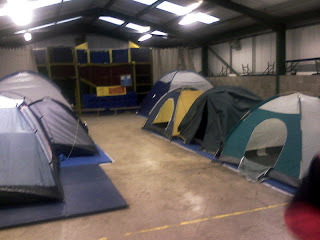 The main event of this weekend was the national Beaver Sleepover which saw over 30 beaver scouts plus their leaders and some parents arriving on saturday afternoon for 24 hours of fun and games, including the chance to camp in proper tents, albeit within the safety of the wet weather hall. This turned out to be the best option by far, as saturday night saw some wild weather which soaked the outside campers; a SSAGO group from St. Andrews University and staff member Henry's scout group from Dunfermline. Apart from this brief spot of bad weather, the rest of the weekend was good with all activities going ahead as normal. Despite having had a relatively sleepless night due to the novelty of having their first camp (and no doubt too much fizzy juice and sugary sweets), the beavers were out of their 'campsite' early sunday morning for several hours of activities including archery before being picked up mid-afternoon to go home for a proper sleep to ensure they didn't spend the next day at school sleeping. Above : Indian Rope Trick. Ali amazes Dave with his levitation skills. As there weren't too many activity sessions over the weekend, the Fordell staff were unsure what to do work-wise instead, but in a moment of inspiration on Friday night someone suggested that it would be good idea to enhance the climbing tower a bit by adding a 'rope ladder' of some form to the overhanging side (as if it wasn't hard enough for some already). On saturday afternoon a suitable hefty rope was soon found in Ye Olde Rope Store and after a few experiments a knotted rope was added to the tower. Unfortunately none of the staff present were fit/agile/light enough to try it out (the best attempt getting 2 feet off the ground), so it was left to a birthday party group to become the first to try it out, most of the kids climbing effortlessly to the top. Feedback from them was good - they enjoyed climbing the rope more than using the holds on the wall - so the new addition looks set to stay. 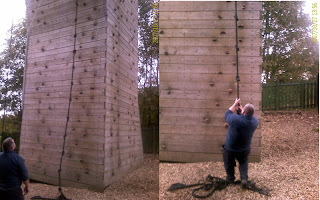 Above : (Left) Bob wonders how he is going to carry out the necessary weight/stress tests on the new rope. (Right) Problem solved! Sign up to have blog updates delivered by email! Fordell Firs is one of the three National Scout Activity Centres situated throughout Scotland. We are situated in Fife, just outside Dunfermline and 20 minutes drive from Edinburgh. We are within easy reach of rail, bus, motorway and airport connections and close to the Rosyth ferry terminal. The centre provides full and half day packages with programmes tailored to suit individual requirements. 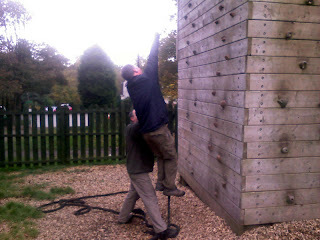 We can cater for a very wide range of groups/events from Scout camps to corporate team building events. The huge camping ground provides an idyllic setting for staying under canvas and there is indoor accommodation available too.